Nicholas and Sam - what an amazing start to the week! 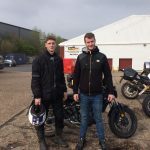 A big well done for Nicholas Whitehead and Sam Wolvey, both passed mods1 & 2 and got their full licences on the 3rd day of training – what a fab start to the week for you guys, and shshhh don’t speak too soon, but I think I see the sunshine so just in time for the summer hey fellas! I Turned 24 a week ago and was waiting to do my full test. Decided to do it with MTS as had heard good things from others that recommend them. I did a 3 day course over Saturday, Sunday and Monday with Max and Ian, I could not recommend them enough. They broke everything down so I could understand everything clearly and really helped with my confidence on the roads. They are always happy to answer all my questions no matter how many I asked. All the staff are very friendly and a great bunch of guys I would concider friends now. I passed my Mod 1 and 2 first time today (8/4/19) with no minors on either test, this just shows the quality of teaching they provide! If your thinking of doing your test go for it with these guys, you wont find a better riding school!